great size, excellent quality, dreamy cotton sheets. Experience the luxury of this Egyptian-cotton sheet set while getting your much-needed rest. 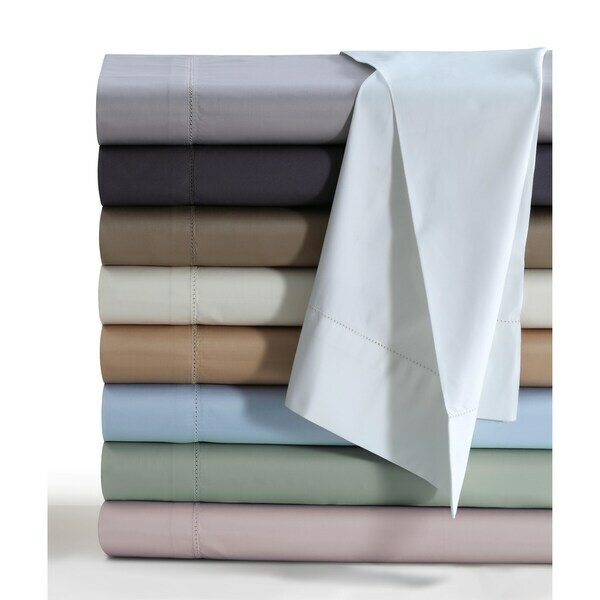 Available in many colors, this extra-deep-pocket sheet set with generous size flat sheet features a sateen weave for softness and has a hemstitch embellishment that adds a stylish touch. When needed, toss this set into your washing machine for easy care and cleaning. Dimensions 16.0 In. X 10.0 In. X 6.0 In. Finally, a extra deep pocket sheet that actually fits my thick mattress with a featherbed on top and still had lots of room. The quality of these sheets is excellent. These are a heavy, soft sheet, very large so have lots of room. They do recommend washing in cold water but with the size of these sheets I don't see how they could shrink so much in hot water that you couldn't use them. They have a thick elastic band around them and are made to actually fit the corners. I plan to order another set. I see where these sheets are well over *** & I can see why. The feel is amazing. They are a thick, soft, luxurious sheet, heavier than most so might take some people time to get used to that. But these sheets will last for years where other, cheaper sheets wear out. Also high thread count sheets get softer with age. These sheets easily fit my big mattress. 78X80" is how all king size fitting sheets should be made. Most products are 76x80" ... too tight to fit. This set is my second order for my husband's king size bed. Fit my 24 inch mattress GREAT! These are deep pocket sheets up by 21 inches of mattress. Great quality for the price. The sheets are very nice and well made. However I was not pleased with pillow cases they do not fit well. They are about 3 inches to short and about 2 inches to wide. I will have to make alterations, to make them fit properly. I bought this because the last time I purchased High Thread Count Egyptian Cotton sheets from Overstock they were fantastic. I bought them for a queen size bed, washed them once a week for three years and never had a problem. They just got softer and softer. But we recently bought a King Size bed so I needed new sheets. My new mattress is 15 inches deep. These said they would fit up to 18 inches so I thought they would be perfect by the time I washed and dried them and I would have no problem. Well, of course, (Murphy's Law) they did not shrink at all. So my "problem" is that I thought that "18" inches" was probably an exaggeration. It wasn't! I have to tuck the extra material in and I may just do some alteration so they will fit my 15" mattress better. So if you have an 18" mattress this set will fit it even after being washed and dried several times. They are very comfortable sheets with ample size pillow cases, too. I am expecting them to last me for many years. Love these sheets!! They fit my 24 inch mattress perfectly, and are so very soft!! These sheets are awesome, beautiful color, nice fit. We have a king size bed with 6 inch pillow top and a 6 inch featherbed on top of that and these extra deep pocket sheets had room left for more. Very soft and comfortable for a very reasonable price. I highly recommend these wonderful sheets. Very nice quality the actually fit my 24 inch mattress I love them. I have the fattest bed known to man/woman kind. I have added layer on top of layer and we call it "the cloud bed." BUT try to find a sheet that fits all of this! I HAVE FOUND IT, AND IT IS THIS SHEET. No matter how fat you think your bed is, and no other sheets fit.... THIS ONE does! Yeeeeeeeeeeeeeeeeeea! and great texture and all that. LOVE LOVE LOVE this sheet set. I have never spent this much on a pair of sheets, but I read the reviews & thought I would take a chance. Well, I want be buying another set. For the price I spent, I expected these sheets to be much more comfy. They do have extra deep pockets, which my sheets do stay on. I washed them as soon as I got them, and they started to get those fuzzy balls on them. Which I was NOT happy with. Went by instructions too. The sheets are comfy, but not $$$ worth comfy. Disappointed BAD with this purchase. If you need the extra deep pockets, then they are ok to buy, I just expected alot more softness & much more elagance feel to them. They are much better than Walmart's sheets. Just think before you spend this kind of money. Oh yeah, they are very thick sheets. Gonna buy another sheet somewhere else & save these for Fall & Winter sheets, do to thickness. After one washing ths seems on one of the deep pockets is beginning to separate and one of the seems on the flat sheet is fraying. Do not recommend! When you pay for expensive sheets, you expect high quality. I have purchased eqyptian cotton sheets before and these are not egyptian cotton. My sheets I purchased before were so thick wrinkling was not an issue. These are thin. Not thin like regular sheets, but not thick like you would expect. Firstly, I am no metrosexual or softy. I slept on the floor for two years whilst living in NYC. I now own a home with my girlfriend and thought ok lets get some decent sheets. I was replacing my previous cheap pair from a well known member wholesaler. These after four years ripped in half. These 800 thread count sheets must mean 200 tc cotton and 600 tc steel wool. They are like sleeping on a giant sheet of pumice. So rough in fact that they are noisy while shifting about! They are total crap. The color is also off. Slate looks medium gray in the photo. In reality it is actually a light gray mauve color. I actually like it but it is not what's pictures. I had returned a previous set of sheets from this site due to a bad color match. I'm so over buying sheets I kept these chaffy pieces of junk. Don't buy these sheets. You are better than that! If you have a really deep mattress the fitted sheet in this set is the bomb! I have looked and looked and though other sets were promoted as deep these truly are 24 - 25". The quality is quite nice too. I am very happy with this purchase. These sheets are truly fit deep pocket mattresses. The only reason I did not give them an excellent rating is that they are thinner than I expected, but still of a good quality. The fit our extra thick pillow top!! The fit our 22 inch pillow top and didn't shrink too much to fit easily around the mattress. The fitted sheet of countless sheet sets shrank to the point where they were unusable. We'll continue to buy these sheets moving forward... that is until the day comes to buy a new, thinner mattress. The only drawback is my wife thinks they're just a little rough. I think they feel great. The sheets arrived quickly and the color (steel) is a shade darker than I expected. They are a heavier weight cotton, as expected, but you can tell that these are not manufactured by a high-quality company. While the sheets are soft--especially after the initial wash--the stitching is way off on one of the pillow covers and the stitching on the bedsheets are poorly done. There was also an deep, black ink(?) stain on the flat sheet which appears permanent. We just moved and are in dire need of king-sized sheets so I will not be returning the product but most likely will not purchase similar items in the future. They are useable and work fine for our purposes now, however. We have an adjustable bed with a seventeen inch mattress. The problem was getting the sheets to stay on the corners. Problem fixed! The bed moves and the sheets stay put. Sheets are beautiful quality with a very soft yet crisp feel, perfect for summer. Very happy with purchase! I THOUGHT THEY WOULD BE SOFTER, A LITTLE SCRATCHY, AND THEY WRINKLE LIKE CRAZY. I WOULDN'T BUY THEM AGAIN. Very nice sheets. I was first put off by the cost, but after a couple of nights sleeping on them they're completely worth it. Got a new mattress that is only 10" thick so keep in mind that the deep pockets are deep and will cause unwanted ruffles after sleeping. I would definitely recommend this sheet set. If you have a bed that requires deep pockets of 17-18", it fits perfectly without straining to get it on the bed. These are quality sheets that last a long time. "24" deep? This is getting ridiculous. Where are your high quality sheets that fit a normal sized mattress? 24" would fit both my mattress and box spring!" "What does sateen weave mean? Do you have the same size ( extra deep pockets ), egyptian cotton and thread count in sheets that are not sateen weave?" "when will the King and Queen in white be back in stock?" "Is there any way to know for sure what color is what? These sheets do not have the color names next to them." Image 5 is ivory, image 8 is Taupe and image 9 is white. Hi Nancy- the colors are pretty accurate. So far I have ordered the taupe and the white and the red veers claret- a cooler red/burgundy- gorgeous. Hope that helps. "What color is the cafe"
There is a labeled picture on site and when you select the set. We bought the cafe color and it has a golden look to it rather than light brown. "How many inches deep are the pockets?" Our mattress is 14 inches and the sheets fit great. They are listed as 24 inches deep in the product description. OUr mattress is 18 inches deep and there is room to spare! Pockets are very deep, fits our 16" mattress, with room to spare. "Can I purchase additional pillowcases?" Unfortunately we don't sell additional pillowcases.